Halloween treats are steadily filling my pinterest feed, my bloglovin’ emails and my trips down every aisle in the grocery store. So I figure it’s time! 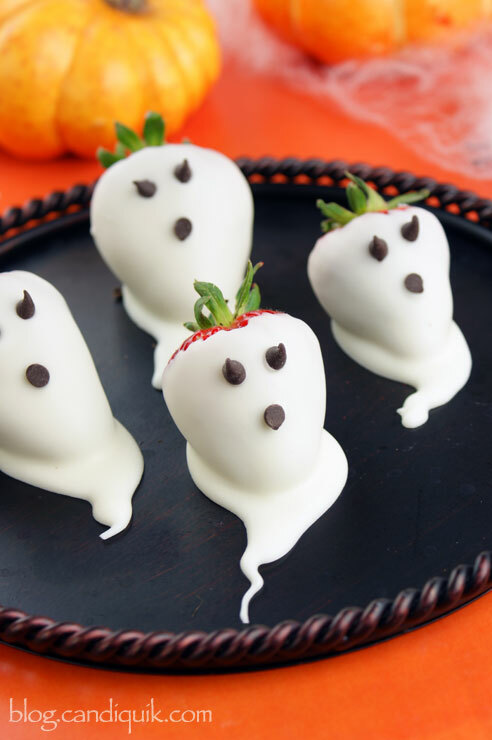 I love these little strawberry ghosts! I originally made these two years ago but never posted them on here. You may have came across them on the Candiquik Recipes site but they are back and improved with a couple changes! This time around, I used mini chocolate chips for the eyes and the mouth. (Last time I made these, I used an edible marker). Let’s just say that mini chocolate chips were easier. I whipped up about 18 strawberries in 35 minutes and still had Candiquik leftover. Usually when you are dipping anything in chocolate, you are worried about coating pooling at the bottom and having all that excess coating to break or chop off. Not with these, as that’s exactly what you are going for! So give the strawberry a healthy dip in the Vanilla Candiquik candy coating and immediately bring to the wax paper. Holding the stem of the strawberry, let the excess coating drip off and form the tail. As you can see, I drizzled the coating off of the end of the strawberry before setting it on the wax paper. Each ghost will be unique, have fun with these! It doesn't get much better than a chocolate dipped strawberry! 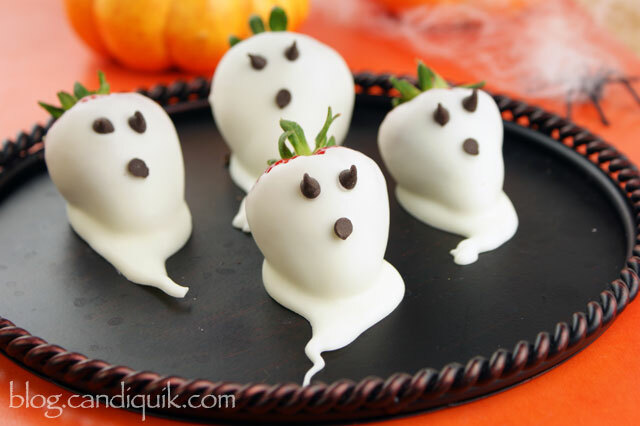 These strawberry ghosts are cute, easy to make and perfect for Halloween! Melt Candiquik in tray according to directions on package. Dip strawberries in melted Candiquik Coating, remove and allow the excess coating to pour off onto the wax paper to form the "tail" of the ghost; slide the strawberry back and set on wax paper to dry. Before coating has set, place two mini chocolate chips on as the eyes. For the mouth, cut off the tip of a mini chocolate chip and place on the strawberry with the bottom side facing up. p.s. do you follow me on Instagram?! Seeing ‘behind the scenes’ pictures is always entertaining, especially if you’re nosy like I am. Follow me HERE (or just peek through the photos & videos). 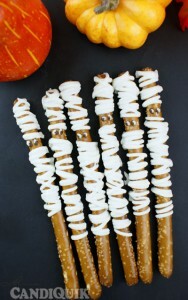 And these Mummy Pretzels?! Too cute!